Looking for a special gift for your bridal party which they will treasure? Then this is a beautiful gift. This can be personalised with any name, role or message. A classic Round Quartz Pocket Watch, featuring a round white dial & presented on a 35cm chain, this watch oozes class. 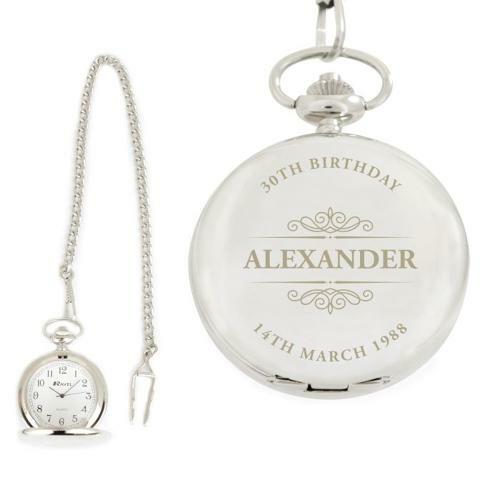 The pocket fob watch can be personalised with a name in the middle up to 12 characters, with a line of text at the top with up to 20 characters and a line at the bottom with up to 20 characters. All text is fixed upper case. ASPIRE reserves the right to alter the layout of a customers request if we deem it to appear better after engraving. We have a no returns policy on this item, however, your statutory rights aren't affected.